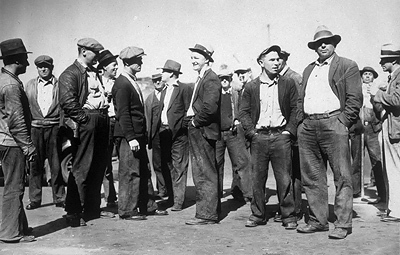 In the spring and summer of 1934, over 12,000 longshoremen on the West Coast of the United States went out on strike from their waterfront jobs for 83 days. The ranks of longshoremen were soon strengthened by the other craft workers in the marine industries, including sailors, engineers, firemen, oilers, watertenders, wipers, cooks, stewards, masters, mates, and pilots. 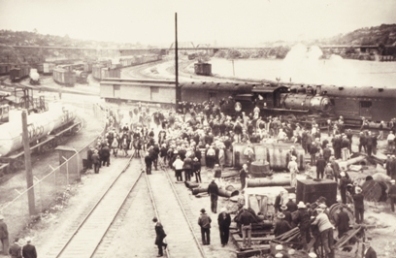 At its height, almost 35,000 West Coast maritime workers participated in the strike, and other unions, such as the Teamsters, refused to handle unfair waterfront cargo. By the end of July 1934, the labor unrest in Western U.S. ports claimed eight lives and hundreds of injuries, engulfed the city of San Francisco in an “insurrection” and “revolt against government” with 130,000 workers out on strike, and almost set off subsequent general sympathy strikes in Portland and Seattle. In the Port of Seattle specifically, only one ship managed to leave the harbor during the whole 83 days that maritime workers were on strike. This study sets out to retell part of the Pacific District ILA’s story from the perspective of organized labor during the 1934 longshoremen’s strike in Seattle. Attempts will be made to highlight unique events experienced by the Seattle ILA Local 38-12 within the wider strike, shed light on the longshoremen’s major demands by looking at the union’s earlier history, and provide readers with important background on some of the labor dynamics that existed on the waterfront. Before beginning this narrative, it is important to note the enormous debt that this author owes to the work of Professor Ronald Magden of Tacoma, Washington. Ronald Magden has spent decades of his life studying longshore unionism in the Pacific Northwest, and his meticulously researched book on the history of longshoremen in Seattle, as well as all the primary materials he collected, are the foundation on which this work is based. In order to fully understand the Great 1934 Longshore Strike, it is necessary to begin our study with an investigation of the general position of labor in waterfront industries, as well as offer some background history on the International Longshoremen’s Association from the first longshore strike in 1916, to the establishment of the so-called “fink hall” in the 1920s.